If you are new to my blog, Welcome! In case you missed it, be sure to read my Introduction and Getting Started post, so you know what the KonMari Method is all about and the reasons why I am doing it. To date, I have completed the first category - Clothes - you can read about it and see my before & after photos HERE, followed closely by the second category - Books. NOTE: Paper was a mammoth task for me, I completed it over 3 days using Marie Kondo's rules as a guide. I have been dreading this category since I read the book. After completing the first two categories - Clothes and Books, I decided to have a break over the weekend, so I could mentally prepare for third category - PAPER. I admit it, I am a paper hoarder - I keep almost EVERY piece of paper that comes my way - anything from movie tickets to bills (dated as far back as 2012!). And I wonder why I can never find anything. That is all about to change...many thanks to the KonMari Method. Marie Kondo's rule of thumb is to discard everything, because paper will never inspire joy! I know, my jaw hit the floor too! I just can't...I will NEVER be a paperless person - I NEED paper in my life! I am very much a paper person. Now why couldn't she just start with that, rather than giving us all a heart attack about getting rid of ALL of our paper! I have so much paper in my home, it's ridiculous, and the worst thing is, is that it's spread around my home in different areas. So my first job was to corral it all together in the one spot (the lounge). 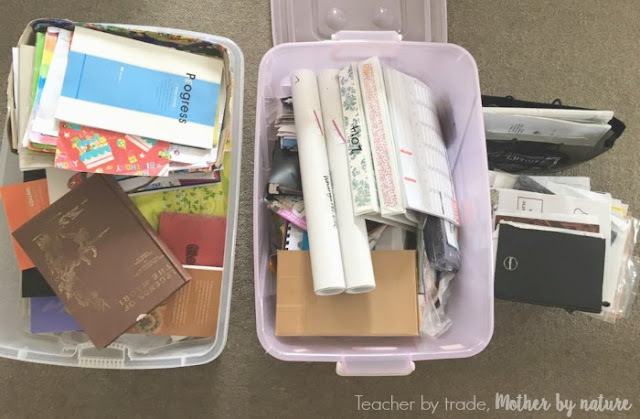 I probably have about 5 x 60L containers full of paper and that is not including my teacher resources. 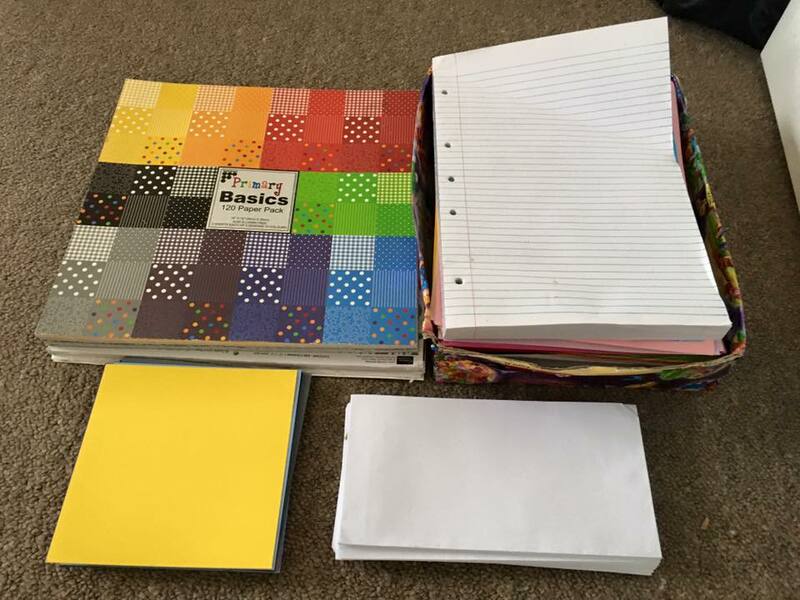 NOTE: My teacher resources is a category of it's own, so I have decided to tackle it later on in my journey. Now can see you why I was dreading this category! YIKES! 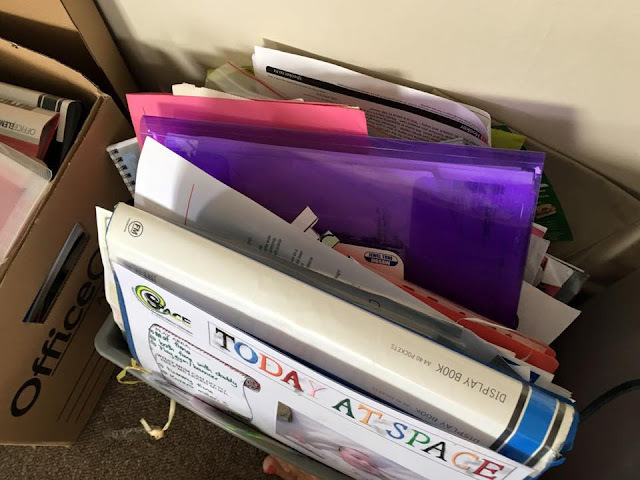 In these containers I have all sorts - receipts, warranties and manuals, tax documents, insurance policies, notes & notebooks, greeting cards, bills, medical documents (for my daughter), Custody papers for my daughter and Home Owner documents. Just looking at this pile I was feeling VERY overwhelmed...however I took a deep breathe, got comfy, grabbed a stack of papers and started sorting. I had a rubbish/recycling bag next to me that filled up pretty quickly, and I could already see the KonMari Method making a difference. I started to feel lighter too. I probably spent a good 30-45 minutes going through every single piece of paper from all these containers and boxes. Like Marie Kondo suggests, I did it in one shot, as quickly and completely as possible. Now my piles were a bit of disaster, however by the end of this step I had purged probably half of the pile. Amazing! And that was just the beginning. 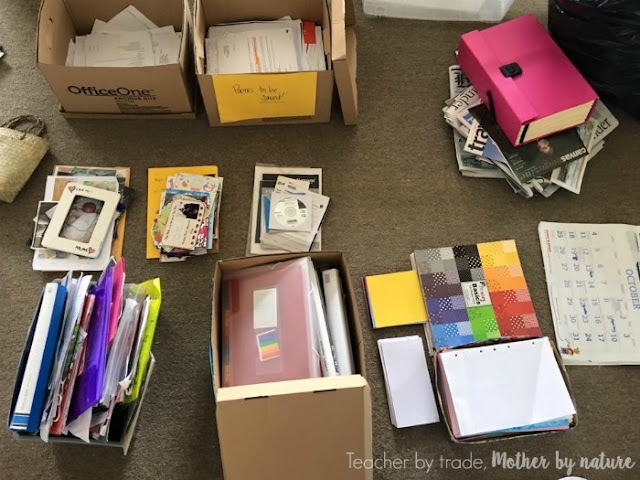 As I was rummaging through my mountain of paper, I came across photos, cards, warranties & manuals, craft paper and calendars - so I put them into piles (most of which have been moved to the Sentimental pile for sorting at a later date). 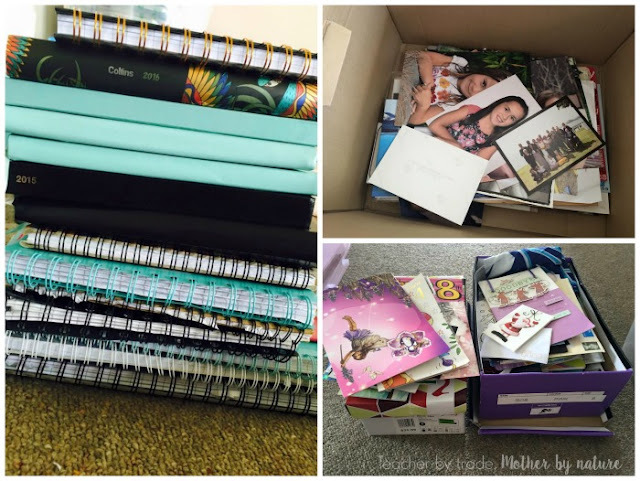 Notebooks, Photos and Cards are now a part of my Sentimental category. So many notebooks - addict much? After Day 1, I was feeling fantastic! 2 empty containers, a rubbish bag full of purged paper, an empty concertina file (my nemesis) and a stack of newspaper - ready for recycling. Phew! On Day 1, my aim was to throw out anything that didn't belong to one of three categories: Currently in use, Needed for a Limited time and Must be kept indefinitely. Now that I have gone through my massive mountain of paper and managed to cull it by half, I am ready for Day 2. 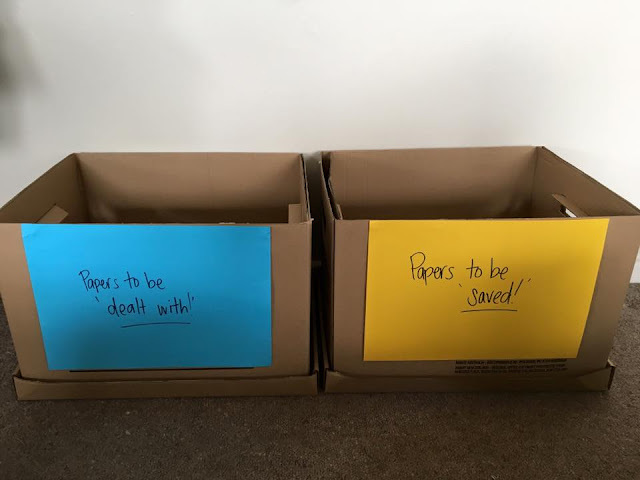 For the next part of my Paper purge - I grabbed two cardboard boxes and labelled them 'Papers to be dealt with' and 'Papers to be saved'...and started the process of sorting my pile from the day before into these two categories. 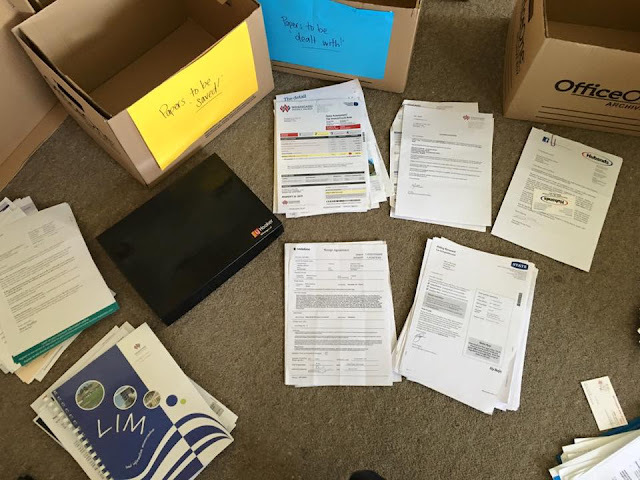 Papers to be saved included things like insurances, taxes, medical documents, home documents etc and Papers to be dealt with were papers like bills, notices, takeaway menus and papers I am currently using and need to sort. Feeling overwhelmed at this point because my Sentimental pile is getting bigger! Argh! 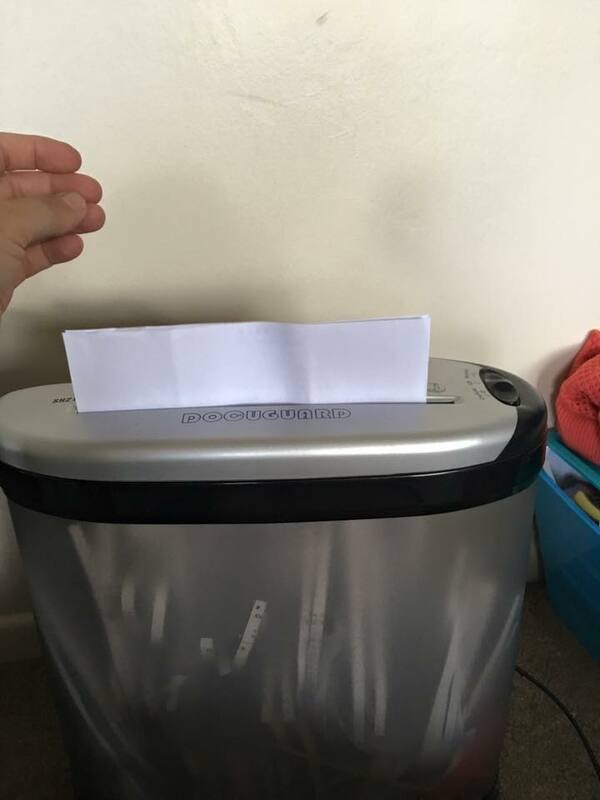 I added the below container to keep all the extra 'sentimental' papers in. It's going to be a mission when I get to that category. Once I had finished my pile of paper and sorted it into the above categories, I called it a day. I was emotionally & mentally exhausted! I was over paper! At this point, the way I was feeling, I felt like throwing it all out, discarding everything like Marie Kondo says. If I did that I would probably have an anxiety attack, break down and cry! I was however, happy with what I achieved. I managed to purge a bit more, some things I missed from Day 1, and some I came to the realisation that I don't actually need to keep. So that's a positive I guess. DAY THREE - Selection Criterion: Does it 'spark joy'? I woke up on Day 3, feeling refreshed after walking away from the task (sometimes you just have to walk away), I looked at the two boxes and was surprised at how much I actually purged from Day 1 & 2. Combined, the pile was only half of one box, so that in itself is HUGE for me! How did I manage to go from 3 x 60L containers worth of paper to half a cardboard box? 2. Needed for a limited period of time (Frequently used papers) - e.g. Paid bills, Medical documents (repeat prescriptions for my daughter). 3. Must be kept indefinitely (Infrequently used papers) - Insurance, Tax, Home documents, Custody documents etc. The 'Infrequently used papers' file is stored in my Office while the rest are stored in a magazine holder in our Command Centre. Study Materials: or in my case - Teacher Resources. I will be doing this one on it's own. Watch this space. Credit Card Statements: I took Marie Kondo's advice and got rid of ALL of our Credit Card Statements. I came across a lot of unopened statements, so it was obvious that we didn't care much for these statements, so I have stopped the paper statements and will check them online when and if we need to. I had most of our warranties and manuals in the cupboard above the oven, however when I was sorting through all of my paper, I came across a few more warranties. TIP: If you buy a new electrical appliances, attach the receipt to the warranty and file it away. I discarded most of the manuals we had because if I have any problems with my electrical appliances, I tend to ask Google, Siri, or the shop I purchased it from. 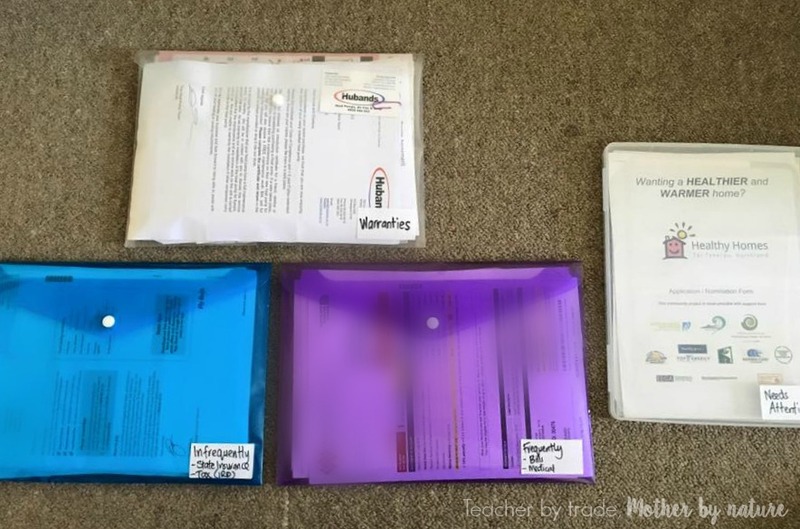 The manuals I did keep and stored in this poly-file (pictured left) with the warranties. Everything is in one spot and if we buy new appliances, I will be adding the warranty to this file straightaway. As I have already mentioned, I will not be sorting/purging my greeting cards, as I consider these Sentimental. So I will add these to the Sentimental category at the end. It's definitely going to take me a while to get through it all. I get all of my pay slips sent to my email, however my partner still gets paper pay slips. 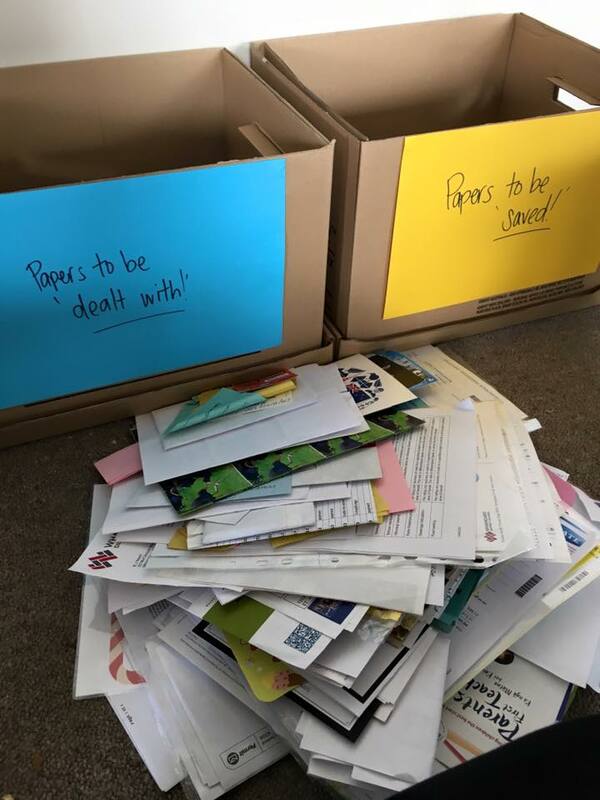 Most of them were still in the envelopes (unopened), so I collected them all, asked my partner if he wanted them, he said no - so I have added them to the "shredding" pile! And then asked him to let Accounts know at work to send them to his email from now on. So hopefully no more paper pay slips coming home. Wow! What a massive category that was! I will be honest with you - my Sentimental pile is much bigger now, however it wasn't the right time. I really need to be in the right head space to go through it all, and this week I just wasn't. I am loving the small pile of paper I kept - everything I am keeping is for a purpose (Home, Tax, Insurance, Medical etc). The filing system is simple, so hopefully it continues to be like this. It's just a matter of keeping on top of the paper that comes into the house. I managed to recycle 2 rubbish bags full of paper, shred half a bag and 1 bag was rubbish. Although this category was hard for me, very hard at times - the end result is and feels amazing! Are you a paper hoarder? 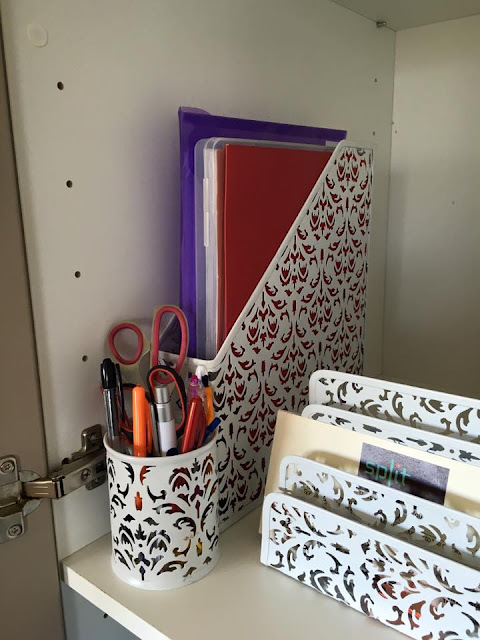 How do you store/organise the paper in your home? Could you ever be 'paperless'? Please note: The Komono (Miscellaneous) category has several sub-categories, so I will be sharing a post for most of them. Watch this space. 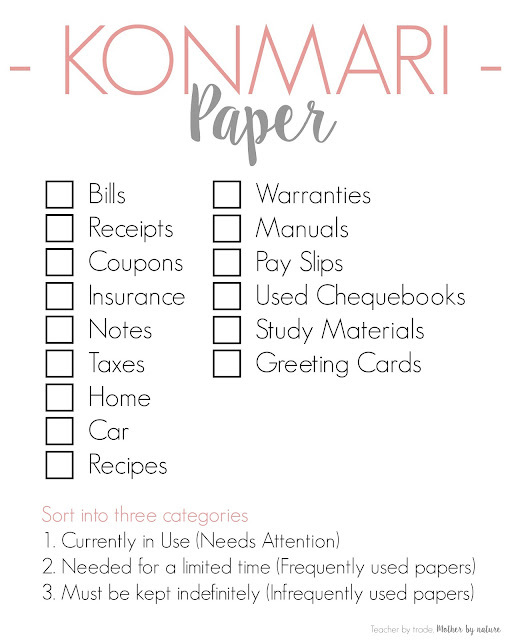 If you would like to give the KonMari Method a go, and you don't have the book - Here is a checklist of the third category - Paper. Click the image below and Save/Print. You can also view my previous checklists for Categories, Clothes & Books HERE. You go girl! It definitely feels great to get through it all Rosa! I am determined to keep on top of it now! Wish me luck! 5 60L containers of paper! No wonder you weren't keen on that Charlene! Where did you buy the book? I want it! I know Haidee! If I put all the paper I owned into the containers, I would have about 5! Crazy. Now I have about a quarter of one container! How awesome is that!! I bought my book from Whitcoulls. Paper Plus has them and you can also buy it online. I think I need this book. If there was a gold medal for paper hoarding, I would win it hand down. But I need to know, how did you go with the sentimental stack? Could you bear to part with any of it or did you keep it all?! the Sentimental category is the last category of the KonMari Method. I will be starting Komono (miscellaneous) next week. Watch this space! Thank you Shannon. I am really not looking forward to the sentimental category, it's going to be HUGE for me, like the paper was. Watch this space for more KonMari goodness! I just finished Marie Kondo's book yesterday. I'm really excited to get started! I don't think that I'll have much trouble with the paper part, it's the books that will be hard for me. Awesome Paula! Good luck with your KonMari journey! The books would b super hard for me! Good on you though, you must feel much better! It really does Amy! I feel so much lighter already. Well done! Paper is a hard category for me too! Most confronting is starting and compiling it all in the first place as I have two filing cabinets full of paper and piles in several places. I also have a stash of sentimental cards, mainly homemade ones from my kids, I've already filed away. You sound like you are well on your way too! Thank you for stopping by. Wow! What a huge task!! Thanks for being so detailed about how you went about it. I do have the book but haven't read it as yet. It's on my to do list!! Thank you Karen! You will read it when the time is right! When you are ready to start the KonMari process I will be here cheering you on all the way! The thought of doing this is intimidating but oh how wonderful it would be once done. Ive seen that book in the bookshop - may be tempted to pick it up next time. Thanks for sharing this - its inspiring. Good on you! What a mission! We're lucky that we haven't been married for a year yet so only brought into our house what he had in our individual bedrooms (plus all the engagement and wedding presents!). Even so, junk accumulates so quick right?! Another KonMari fan :-) Just KonMaried my house, what an awesome feeling, I totally get it. Definitely think you are smart leaving the harder area (children's) till later, I call it your letting go muscles will be flexed by then. It gains a momentum doesn't it, culling, love it. Impressed with how much you reduced your paper work too!! Our papers are one of the few areas left we haven't done (involves my husband there and that takes time). 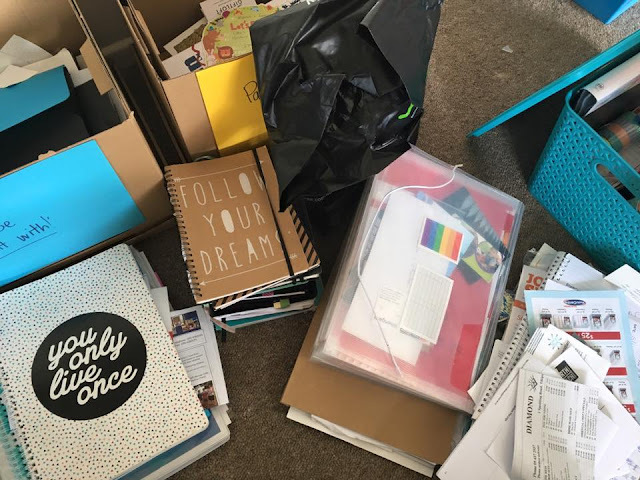 I've recently posted about our journey if interested, how we adapted KonMari to a large family and how I gave away 800 books!! Well done you! I'm sure I've got way more paper than you stashed all over the place, so I think this would take me a lot more than 3 days. How do you manage this with the kids around? 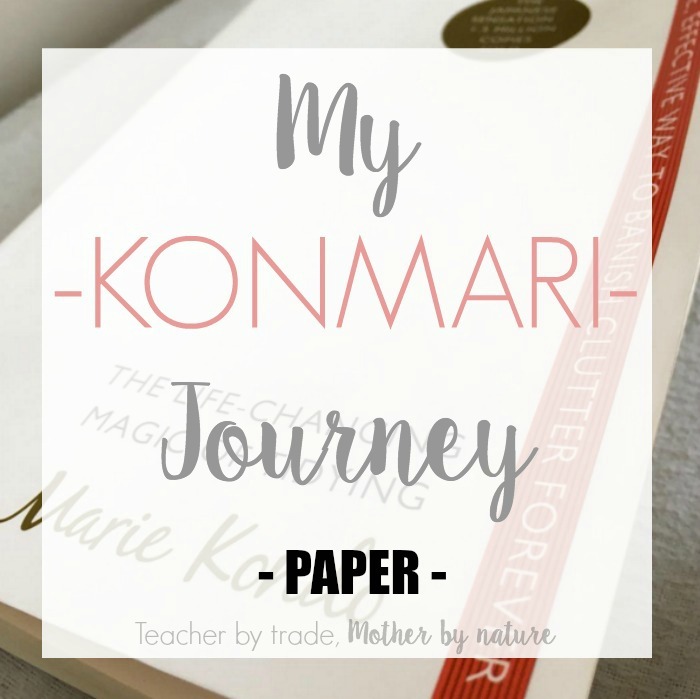 We started paper, just as a purge, rather than explicitly for KonMarie purposes. 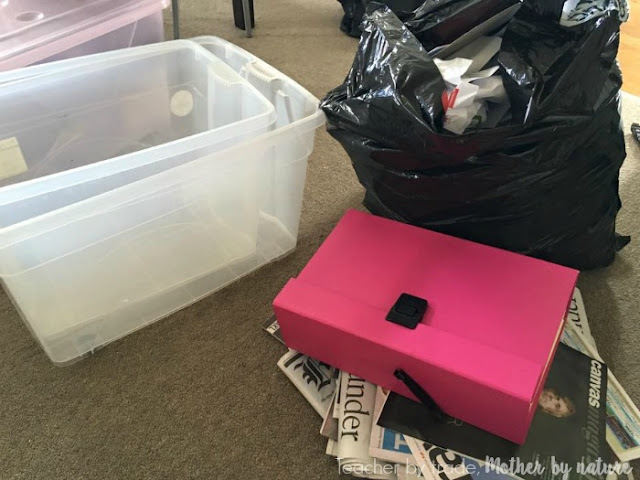 We went through our two filing boxes and pulled out heaps! 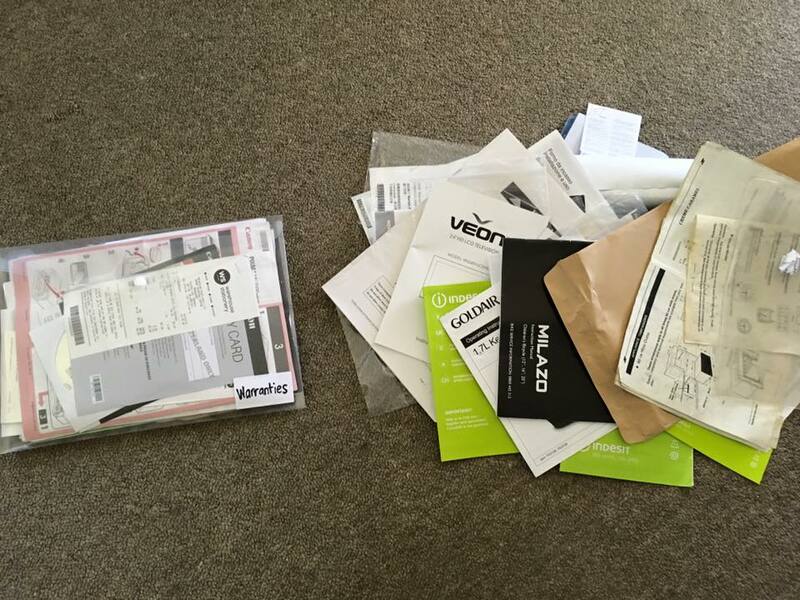 Loads went into the commercial shredding bins at our workplaces, and heaps more was scanned into a digital format (receipts, tax records, old bank statements etc that we will probably never need but may find helpful) and then were shredded. There are a handful of documents we have kept the physical copies of out of the sections we have done so far (that work stalled about a month ago, we were doing half an hour a night). Its great, because the stuff is now all stored in a shared google drive as pdf - both of us can access it any time, anywhere. Sounds like a solid team effort! Well done! Great idea scanning and saving them in Google Drive. Thanks for stopping by. Thank you for this post. I am currently working through Marie's book and have finished wardrobe and books, but papers is SUPER daunting because I write, do art, and save all kinds of stuff "just in case". I recently moved and got rid of a ton of papers but the remainder is scattered and unsorted... Terrifying! Also it's not as simple to hold a document and ask myself if it "sparks joy"... Your post is extremely helpful and I will be reading the rest.